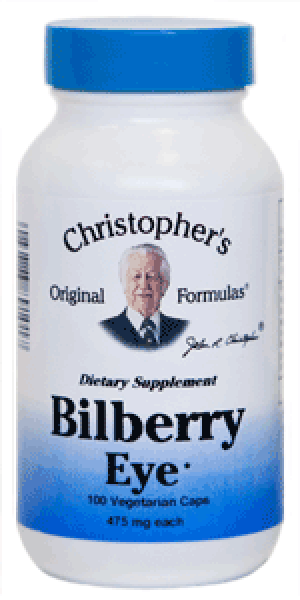 Dr. Christopher's Bilberry Eye Formula A synergistic blend of herbs for the eyes. A synergistic blend of herbs for the eyes. Ginkgo Leaf, Bilberry Leaf, Cayenne Pepper & Eyebright Herb. Also referred to as Billbrite, Dr. Christopher’s Bilberry Eye Capsule comes as salvation for people suffering from serious vision disorders. In many cases, it helps in the treatment of severe conditions, which many other medicines fail to correct. Besides, this remedy is helpful in dealing with diabetes-related eye problems. It is also known to prevent glaucoma – a potentially hazardous condition that may lead to total blindness. Bilberry Eye Capsule is a great choice for elementary school and high school students who are more prone to poor eyesight. Due to the ability to prevent myopia and slow down or stop progressive myopia, Billbrite is highly recommended for such patients. If taken properly, it can save myopic people from the necessity of surgery. Since farsightedness tends to be easier to correct than myopia, you will almost certainly deal with it quickly with the help of Dr. Christopher’s formula. Traditionally, Bilberry Eye Capsule is applied for the treatment of various types of myopia (including progressive myopia), myopic chorioretinitis, night-blindness, spasms, retinal degeneration, diabetic retinopathy, various inflammatory reactions (retinitis, conjuctivitis, keratitis, etc. ), macular degeneration, blepharitis, glaucoma, etc. Based on natural herbal extracts, the remedy targets the weakest and most affected areas of the body. Bilberry Eye Capsule contains the following herbal ingredients: Bilberry Leaf, Ginkgo Leaf, Cayenne Pepper, and Eyebright Herb. These herbs have been used in traditional Oriental medicines from immemorial times for the treatment of serious chronic disorders, such as diabetes, bronchial asthma, hemorrhages, cardiovascular diseases, orthopedic disorders, atherosclerosis, infectious and viral diseases, bronchitis, pneumonia, and even sexual problems. Particularly, Gingko Leaf treats diseases resulting from aging. This herb is known to boost memory and improve flexibility of joints. Besides, the herb bears a strong symbolic meaning in traditional Oriental communities, as it is associated with strength, endurance, and stamina. It is a well-known fact that Bilberry Leaf improves eyesight, although the mechanism of action is not yet known. However, Bilberry Leaf is a highly recommended prevention remedy for people who have to expose their eyes to prolonged strains for occupational reasons. Cayenne Pepper improves blood flow, clears blood vessels, and reduces cholesterol. Some scientists believe it has anti-cancer properties and helps in the treatment of ovarian tumors. Eyebright Herb is used directly to protect eyes, since it produces a strong anti-inflammatory effect, reduces intraocular pressure, and prevents degenerative processes in the eye. As you can see, all the ingredients contained in the Bilberry Eye Capsule produce a complex effect on the entire body. Since eyesight is pretty much an indicator of a person's overall health there is hardly a better medicine than Dr. Christopher’s formula to treat the cause of the disease, not just its symptoms.